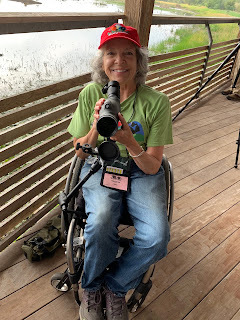 I followed Laurie Foss in my modified van down to Harlingen, Texas to participate in my first-ever birding festival. A large banner outside the Convention Center read Welcome Birders to the Rio Grande Valley Birding Festival! After we picked up our leader packets, badges, hats and shirts, Laurie and many others exchanged hugs and happy hellos. 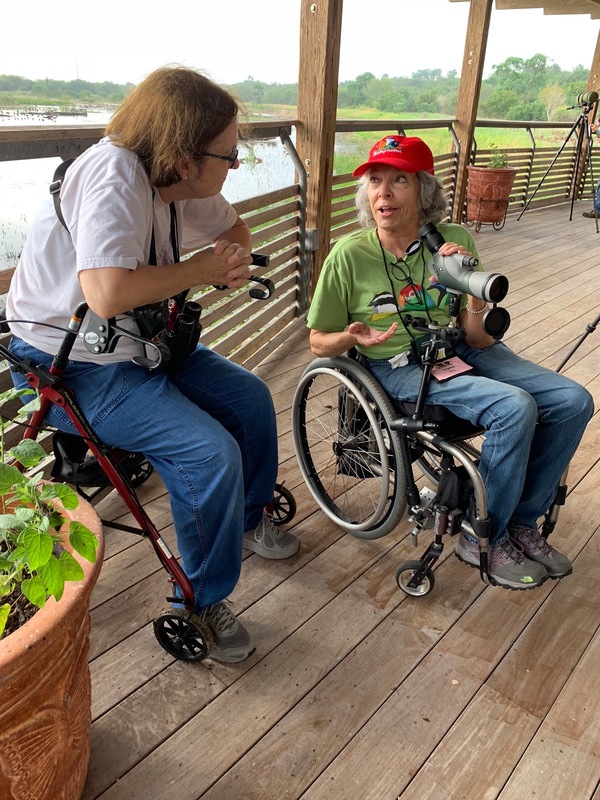 I met Mary Gustafson, RGVBF Field Trip Chair, Guide Extraordinaire, and Overall Amazing Birding Woman, who saw the need for mobility-challenged walks and placed them in the 2017 schedule of the Rio Grande Valley Birding Festival and assigned Laurie Foss as leader. Enormous kudos to Mary for her foresight. 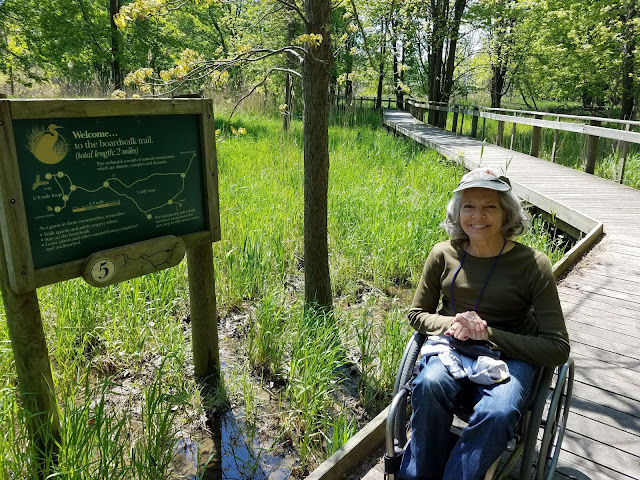 The 2018 offerings included four mobility-challenged walks. We checked into our hotel, freshened up, and went to the evening reception where Laurie introduced me to everyone she knew: guides, administrators, publishers, optics and travel representatives, Texas Parks and Wildlife representatives, photographers, authors, and other movers and shakers, all of whom graciously welcomed me. The highlight of the evening for me was the scheduled meeting of the guides. I took my seat in a small room surrounded by forty or more guides from Canada, Mexico, California, Colorado, Oregon, and the East Coast to list only a few. Many of the guides had been coming to the Rio Grande Festival for over twenty years, and there was great camaraderie amongst them. You could tell they loved leading this particular festival. Each guide introduced him- or herself. Everybody was very warm and welcoming. Many people echoed the sentiment that the time was now for EDI, equity, diversity, and inclusion. 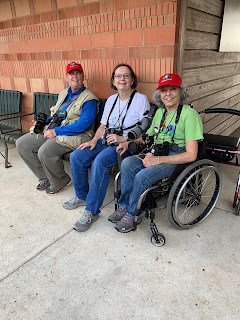 While it was quite overwhelming to be in the company of all those amazing birders, I kept reminding myself that no one else there knew how to bird in a wheelchair like I do. The next morning began very early. 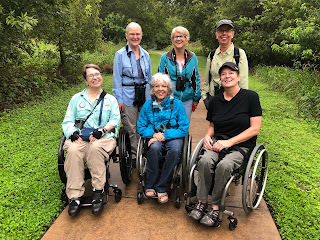 Laurie and I drove to Estero Llano Grande and awaited our first participant, Dorothy, who uses a walker. Dorothy had for ten years participated in the RGVB Festival as a walking person. About ten years ago, she could no longer manage the walks and so began volunteering for the festival. Laurie and I were thrilled to accommodate Dorothy on her first RGVBF bird walk in ten years. We spent three-plus hours on that beautiful deck and picked up over thirty-four bird species. Within ten minutes, Dorothy asked me about my small, lightweight wheelchair. She could see that I had so much freedom, freedom to wheel quickly from one spot to another, freedom to use my binoculars easily without having to lean on anything or be concerned about my balance, freedom to reach into the backpack behind me on my wheelchair, and pull out a field guide, a water bottle, a pair of gloves, a thermos of coffee anytime, anywhere. I could tell that her walker was somewhat limiting. She asked me to send her information about my chair. Though Dorothy could stand, it was difficult for her to use a scope on a tripod. By the time Laurie maneuvered the tripod around her walker, the bird was likely long gone. Frustrating for everybody. 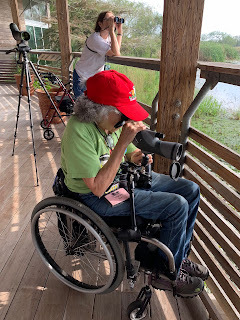 Then I showed her my scope and the way it attached to my chair, and explained that she could be in charge of maneuvering the scope herself and get the views she wanted independently. Her eyes lit up! 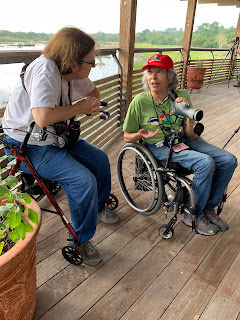 These kinds of conversations, these kinds of exposures to strategies and equipment, this kind of camaraderie, this particular kind of joy cannot happen unless bird walks for the mobility challenged are made available. And, it becomes more obvious that these particular walks are about more than seeing birds. But, I knew that starting out. The afternoon included a visit to the trade shows, where Laurie again introduced me to everyone she knew. Dinner and then to bed. I fell asleep surrounded by field guides and my phone in my hand, listening to olive sparrow vocalizations. One happy birder.